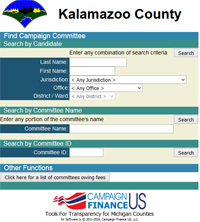 In an effort to provide more transparency in local elections, Kalamazoo County has contracted with CampaignFinanceUS to provide campaign finance reports online. All candidates and office holders in Kalamazoo County (with few exceptions) are required to file at least a Statement of Organization, which is a form that creates the campaign committee. If the candidate does not expect to receive or spend more than $1,000 during an election cycle, they indicate this on the form and are not required to file any further campaign statements. Statements of Organization may be amended at any time when circumstances warrant. All current and active campaign committees' campaign finance forms are available to be reviewed at any time online free of charge. Campaign Finance Reports can also be printed at no charge. We will do our best to place newly filed reports online within 2-3 days of receipt. If you have questions regarding campaign finance reporting at the local level, please contact us at elections@kalcounty.com or 269-384-8080. When someone begins actively campaigning or collecting or spending money towards a campaign, they have become a candidate. This is whether or not the individual has actually filed petitions or an affidavit with the clerk. New candidates are required to file a Statement of Organization with the County Clerk within 20 days of becoming a candidate. The timeframe of the report begins with the day one becomes a candidate and goes to 16 days prior to the election (always a Sunday). This is known as the "close of books". The Pre-election Campaign Statement is filed with the County Clerk before the close of business on the 11th day prior to the election (always a Friday). The timeframe of the report begins with the day after the "close of books" for the Pre-election Statement and goes to the 20th day after the election, always a Monday. The Post-election campaign statement is filed with the County Clerk by the close of business on the 30th day after the election, always a Thursday. Michigan Law was recently changed to require quarterly campaign statements for all candidates not "waivered" (not spending or receiving more than $1,000 or having less than $1,000 in the campaign account) and not appearing on the ballot that year. For example, candidates who plan to run for election in 2018 are not required to file quarterly reports in 2016. However, if the campaign funds exceed $1,000 (whether fundraising is done or not), quarterly reports would be required in 2017. Here is the link to the section of the Campaign Finance Act regarding campaign statements. Training for new or experienced candidates and their treasurers is being planned for 2018. At this point, we are planning to have 2 trainings - one in late May and one in late August or early September. Candidates will be notified of these trainings.